Preheat oven to 375°. Grease a 9 x 9″ inch pan. In a bowl, mix 1 cup flour, 1 cup of sugar (I like to mix white and brown sugar), 1 tsp. baking powder. Add 1/2 to 1 tsp. of spice to your liking. Depending on the fruit, I like cinnamon/nutmeg for apples, a heavy dose of ground ginger for peaches. Add one egg and combine until crumbly. (This will be dry, it’s ok.) Place on layer of fruit. 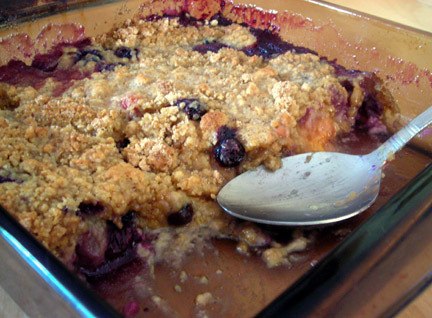 Bake about 30 minutes until fruit is bubbly and crisp is golden. And I didn’t even know bumbleberries were in season. 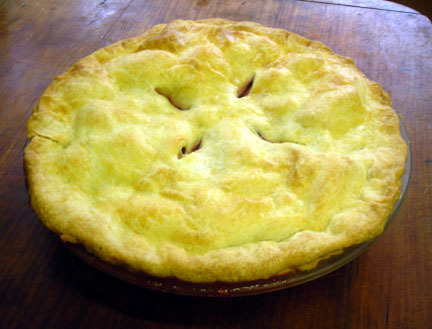 Actually, a bumbleberry pie is apple, rhubarb, blueberry, strawberry and raspberry. Since I was able to pull two of the fruits from the yard, I thought I’d give it a go. Maybe next time, our everbearing strawberries will cooperate and/or the rabbit will stop eating the ripe ones. It turned out really delicious and a big hit at a family BBQ this weekend. The only complaint is that the crust was a little tough. I used butter instead of shortening maybe that had something to do with it. The recipe makes two pies and because of the quantity of dough, I did have to work it a bit more than I would have liked. And lastly, I had a helper (the big boy) rolling the dough. It may have gotten a bit overworked there as well. I know this because he chipped my granite rolling pin on the soapstone counter. I’m glad I noticed the granite chip before it got baked in and someone lost a tooth. Ouch. It’s not until October but I’m so looking forward to it. The ladies in the quilting class are all going to my husband’s aunt’s cottage at Lake Winnepesaukee in New Hampshire for a weekend. We’ll sew, gab, eat and drink without husbands, kids and other distractions for 48 blissful hours. Also on the agenda is a trip to the Northern New England quilting mecca of Keepsake Quilting, only 25 minutes away. 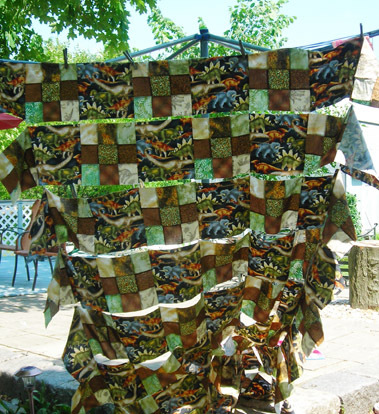 My project will be a blooming nine-patch from the book Traditions with a Twist by Dalene Young Stone and Blanche Young. I haven’t picked a color scheme yet. I’ll have to go check out the stash for some inspiration. These dog days of July are getting hot and tiresome but I’m happy to have something to look forward to. Is it October yet? Every kid’s gotta do it, right? 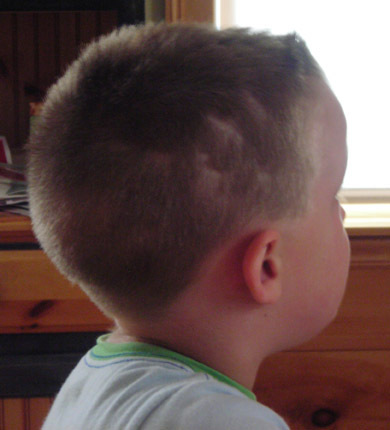 My son gave himself a haircut. He said his grandmother liked his hair flat. Neither grandma remembers this. My mother-in-law said that as a child, my husband chopped off a hunk of his older sister’s hair because he needed a paintbrush. What’s that ‘apple falling not far from the tree’ thing? Yup. 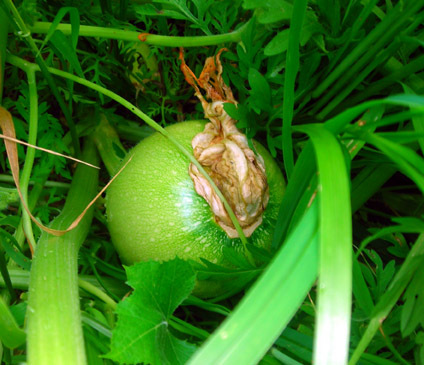 Random musings of a rookie suburban farm missus…. 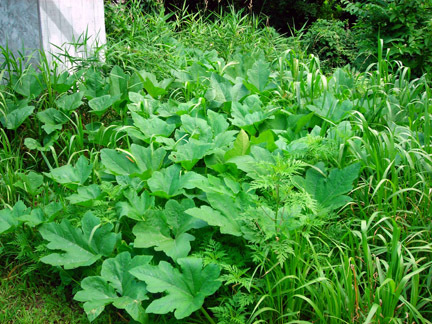 • If you want to be really successful in growing things, plant directly into a compost pile. I bought a tiny two inch potted pumpkin plant for the kids at the store and we put it in a pile of composed leaves and grass behind the barn. It’s a monster now stretching at least 10 feet or more in all directions. And at least a dozen pumpkins that I can see. • We haven’t had a goose egg in almost two weeks. Thought maybe it was the heat. So no challah, brioche or cheesecake (not that I’ve been in the baking mood in this weather). They’ve also been getting a bit uppity, taken to honking at the neighbors and such. It’s really rude. As it turns out, they’ve been hiding the eggs underneath the neighbor’s deck. My husband dug up about seven last night. No wonder they were honking so furiously… protecting the nest and all. 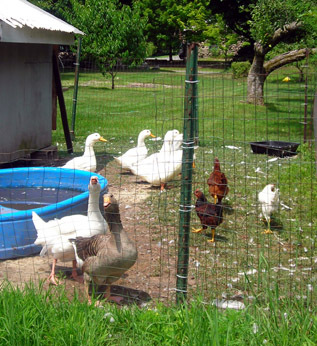 • I know where the expression ‘nice weather for ducks’ came about rainy days, and it’s not because they like the water. It’s all the bugs and worms that surface after a good storm. Them’s good eats for a duck. • And I’ve also realized why they call it ‘chicken fights’ when you get on someone’s shoulders and horse around. Chickens fight with their feet and jump up to scuffle with each other. • And sadly, Peanut Butter (one of the chickens) was lost to the fox last night. We let them roam the yard during the day and put them in the house inside the fenced area at night. Maybe we shouldn’t let them free range but they love it. It was about 7:30 and I would have been putting them to bed shortly when I heard a commotion, not even as loud as the ruckus they make when the neighbor comes home. I could have ignored it but went out and saw the fox had isolated one chicken. I ran after it and the chicken took flight but when I rounded the blueberry bushes, the fox had Peanut Butter in his mouth and was running off. I’m kind of sad. I like the chickens. I guess we’ll have to keep them in for a while, at least until our Fox Relocation program is successful. At least they have a swimming pool. … but hanging on the clothes line, it reminds me of Tibetan prayer flags. Only on this windy day, it looks more like a crazy dinosaur flag. I chain-stitched the nine patches together with the focus fabric blocks in long rows and now I have to sew those rows together. A ‘pieceless puzzle’ my quilting teacher calls it. The chain-stitching holds everything in exactly the right place. Super simple is good sometimes. Even substituting the major ingredient (I couldn’t find flat iron a.k.a. top blade steak) I have to heartily recommend this dish. I got a really nice rib-eye instead and the beef combined with the amazing spinach and sautéed veggie salad is just delicious. I’d make the salad again on it’s own any time. I really should have a picture of these dishes but I’m not usually thinking blog photos at dinner time. We’ve just passed the four (and five) o’clock fussies and I just want dinner on the table so bath and bed can happen at a decent hour. I’ll try to remember next time.